that pertains to that particular situation. 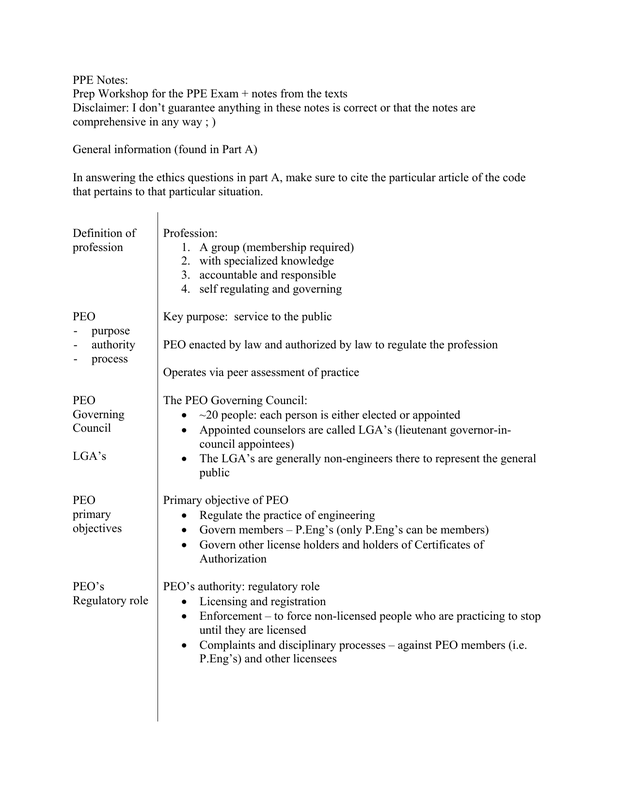 • Complaints and disciplinary processes – against PEO members (i.e. with a licensed Ontario P.Eng. exam, engr work exp, etc. this as soon as they can. 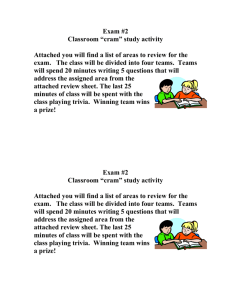 IMPORTANT: study the 20 study cases found at the end of Marston. make sure your answers are more than just yes or no. If you remember a precedent case, you may want to cite it. parties, if there is a disclaimer or not etc. and individuals or private organizations. 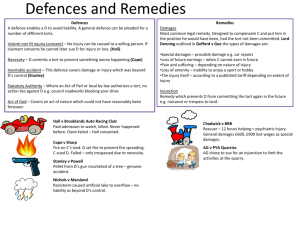 the difference between an indemnity and a guarantee. appropriate, safe use of product. discovered in a product line after sale. 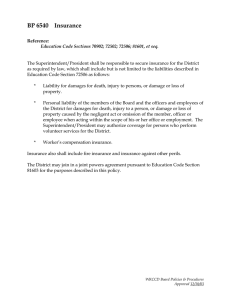 consumer (warranties, conditions of sale, etc.)). which, when present, means a tort can not go forward. resulted in unavoidable lost profit to the plaintiff’s business. 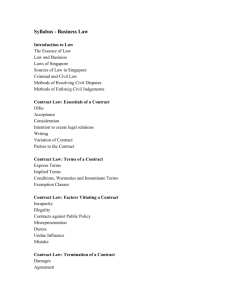 terms under which the contract can be discarded. event of war, flood, labor dispute, etc. contract is liquidated (i.e. not completed). upon then the court uses this principle to award reasonable payment. Engineer has a duty to be honest. can not make a claim. - For contract, limitation period starts at the time of breach. - The limitation period is 2 years for a tort or for a breach of contract. can not alter the limitation period. 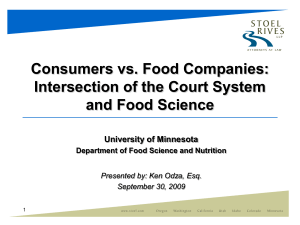 lawsuit: issues and likely scope of questioning. doing so opens one up to liability and criminal prosecution. 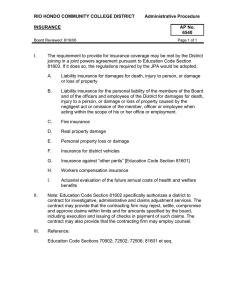 damages (but not entitle discharge). should have been reasonably foreseeable by party who breached. Damages that are not direct. 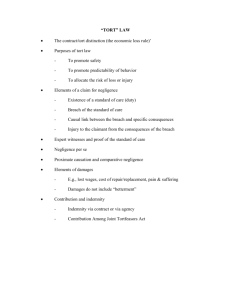 Also called consequential damages. E.g. on behalf of within an agreed upon scope. perpetuating fraud, i.e. fraud -> personal assets can be seized. Tort – civil wrong or injury to an individual. No privity of contract (i.e. applies when no contractual relationship exists between the two parties). the way a criminal action is decided). 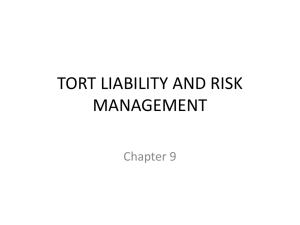 The point of a tort is to compensate (financially) for loss, injury, or damage. by Noranda and had been prepared by a 3rd party (Arthur D. Little). 40%, etc.) amongst the tortfeasors. be liable for a share of the damages). have been foreseeable by the defendant. - collapsed crane that manufacturer should have known was defective. called liable. The plaintiff can be a person, company, group, etc. enjoyment of the plaintiff’s land”. or void, voidable, or unenforceable. (consideration) to a 3rd party without consent of the 2nd party. contract from the actual contract (B) that is being bid on. inaccurately, and obviously, misrepresents verbally agreed upon terms. Party may ask court for rectification of the contract. Mistake in a bid during the tendering process. precedent the bidder (offeror) will probably forfeit any tender deposit. If there is a major unforeseen change that totally changes the situation. or bad weather for example, would not be cause for claiming frustration. 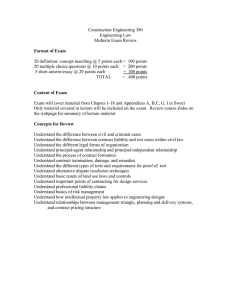 Fundamental breach of contract – breach goes to the root of the contract. contract with the 3rd party included an exemption clause that was upheld. original terms of the contract. when offeree gets the revocation. 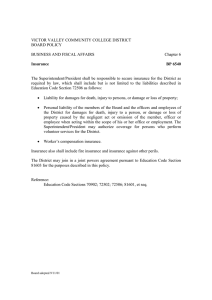 existing contract that falls under the principle of equitable estoppal. is not, enforceable, but will not change the terms to bring it into compliance. Essential terms of the contract have been met. If the essential terms of a contract are met, then the work must be paid for. can’t refuse to pay for the whole thing. unique piece of land or an antique. A contract term in which the party or parties agree not to do something, e.g. your advice (as expert advice) then you may be open to liability incurred. entitled to a lien whether or not there is privity of contract. after that phase of the work has expired. amount and amount of claim pending outcome of the lien. patentee can also seek an injunction. claim for damages; forging a trademark is a criminal offense. entitle the other party to take credit for creation of the work. permission, or used in association with a product, service, or cause, etc.